The exciting 2017 Jaguar F-PACE was honored with two awards at the prestigious 2017 World Car Awards! Not only was the F-PACE named World Car Design of the Year but also received the top honor of 2017 World Car of the Year. This is an amazing accomplishment for Jaguar’s first performance SUV. The awards acknowledge the bold styling of the F-PACE as well as the impressive performance. 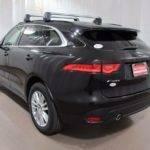 Jaguar’s luxury SUV has the styling to turn heads plus the power to impress! Jaguar Colorado Springs has a super selection of the 2017 Jaguar F-PACE for you to choose from. Visit our dealership in Motor City today. Let us show you this award-winner and all of the amazing features it offers.